If you didn’t know about these fires, chances are you can’t read Greek or don’t keep up with Greek news for whatever reason. English-language newspapers have limited space in their editions, and editors are forced to exercise editorial judgment, so anyone depending on them for a full picture of Greece will have incomplete knowledge at best. If a tree can’t scream for help, is it really on fire? It was Thursday when I felt it, the same feeling I had almost two years ago to the day, when wildfires became an inferno over the weekend. The difference between now and 2007 is weather and location. We had a fair amount of rain this winter, temperatures are moderate for end of August though winds are high, and most fires are concentrated in Athens. I awoke to a yellowish-gray sky and asphalt that somehow looked blacker, and that’s how I knew. Memories of 2007 came flooding back. What I heard could very well have been recorded newscasts from two years ago, with the same script read by relatively the same players. The Mayor of Marthonas recalling how his municipality attempted to clear brush and build anti-fire zones, but Head of Civil Protection Margaritis Mouzas put a stop to it. Mouzas telling SKAI TV that he was on the ground of affected areas, and fires in the region are “a small problem.” Firefighters being asked to pay road tolls, Greece refusing help from Russia and Austria, people pleading for help, media squawking arson, a government spokesman blaming pine trees, politicians condemning the other. ‘Παπαγάλλο’ is a word used in Greece to describe the government because a parrot repeats the same thing without thinking. Reruns. What I saw was also the same. Volunteer firefighters rushing to the scene and finding water tanks full but without a hose to connect. Lack of coordination between national and local authorities. A state of emergency that officially mobilizes units and military from other regions of Greece was not declared until shortly before 13:00 Saturday, though it was clear the fire was out of control by Friday morning. Underfunded, understaffed and underpaid firefighting personnel and military doing the best they can, fighting both fires and obstacles created by the Greek state, which hasn’t equipped them with a plan and the tools to effectively do their jobs. Calls for international assistance from France, Cyprus, Turkey, Italy and Spain (who suffered their own losses) not placed until Sunday morning. Precious time and trees lost for nothing. In a word, chaos. Greece need not worry about external forces invading from the north; the Turks can simply sit back and wait for Greece to destroy itself. I wept silently in anger for the salvation of innocents, the animals and forests we desperately need to keep Athens breathable and livable; to help us remember a kinder, gentler time before the natural beauty of this ancient city descended to cement jungles with razed mountains dotted with illegally built homes and makeshift dumps; to give us hope for a better tomorrow, that we might still have a legacy to leave our children. But there’s a fine line between hope and denial. Some things change quickly and not for the better. Other things never change but should. Until the government shows its people some respect, the people have no reason to respect the government. An excellent and emotive post that hits the nail on the head, as well as providing much-needed information on the situation for non-Greek-readers, for whom details have been thin on the ground elsewhere. My heart genuinely bleeds for the beautiful alpine landscape reduced to dust; less so for the people whose homes were in the middle of the forest, seeing as they were probably built there illegally in the first place. Karma for them, depressing for everyone else and catastrophic for the environment (for which Greece still – still! – doesn’t have a separate ministry, which probably says it all). Hi Bel, nice to see you here again. News space is at a premium and Greece is a minor player in the world except to those of us here in Greece and Greeks abroad for the most part. The other factor is that native Greek speakers sometimes cannot articulate details in English, and native English speakers do not fully understand the intricacy and history of Greek affairs, thus communicating an insular view. CNN, Time, NYT, BBC and AJ do the best they can, but many of their reports are incomplete. I wrote a more critical (and inflammatory) post, which points out that New Democracy campaigned in 2007 with the promise it would set up an environment ministry, but it rescinded just days after voters re-elected them with Souflias seeing no conflict of interest in him being in charge of public works and the environment. I’d like to point out that this man was found in violation of building permits for two of three of his homes, which coincidentally are in forested areas. He blamed his engineer. Need I say more? PLEASE, PLEASE don’t think that is an event that is not noticed by the rest of the world!! 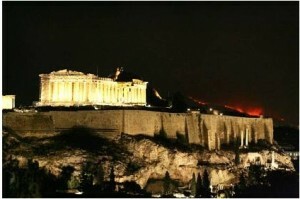 The fires in Athens were the main lead in the New York Times today, accompanied by many photos. I should have been in Athens this week, but unfortunately I had to cancel my trip because of the horrible economy and the loss of my job. It pains me that I had to cancel my trip and to see these pictures. My thoughts are with you. I understand your pain. I hope you are safe. Hello and thank you for leaving a comment and your kind thoughts. I’m so sorry to hear you lost your job, and I hope something will come your way. This deserves your attention and focus more than land grabbers and neglect by the Greek government. I wish you all the best. I’m a reader, one that usually don’t make comments but has read the whole thing because it’s so complete and informative! However, today’s my first comment because to add to the whole post you’ve done, I’ve been one of the victims of these fires when, on Sunday at 5am, the fire “ate” our house to the ashes (Schinias). Now, we’re staying at a hotel and trying to get help from people to get our life back. Please, let me post the link to our pictures in this page because I don’t want to ask for help, but I want to SHOW how this CRIME affect us! Because these fires are not accidents, they’re crimes, you’ll see in a couple of years the buildings popping up on zones that yesterday were declared as “forest areas”. Thank you so much for delurking today, and saying ‘hello.’ I’m sorry that it’s not under the best circumstances, and I’m sorry about your home. The only thing I can offer are things you probably have already done, that is call your insurance company to start a claim and call your bank (if you have a mortgage) to inform them. The Greek government has announced measures to help fire victims and farmers, but let’s be honest. We don’t know if that aid will ever reach you and others. They’re still holding millions of euros in a fund from the fires of 2007, and there’s been no transparency in accounting, just assurances from an overseer. Even promises of reforestation are limp: Stats show that less than 10 percent of burned forest from 2007 have been replanted. Great article and very helpful for those of us not here for the 2007 fires. I was here for the 1998 firestorm, then-posted to the US Embassy. Interesting to see how little has changed, although I do think the fire services have more resources now and have learned some important operational and organizational lessons from previous fires. Not so sure the political leadership has. The central problem that I see, as a private citizen, is the exceptional weakness of the Greek Public Administration. Rules are so rarely enforced that the entire society has decided that its default position is to ignore laws and regulations. Hence arson is one of many crimes that pays. If one tenth of the resources spent on media in this country was spent on good land use (spatial) planning and implementation of regulations and codes, then half of the incentive to redevelop former forest lands would instantly disappear. Enough from me, this is a matter for Greek citizens. I think they pretty much understand what is wrong. I am not sure they are really convinced they need to fix the corrupt and ineffective administrative processes they have all become accustomed to. One needs to ask who are the people that build illegally anyway? Are all of them rich villa owners? Check the countryside. The fire brigade is still using outdated Canadairs and helicopters that are burdensome on pilots and must be maintained more frequently, which increase costs. It’s not their fault. The house voted to update the fleet, but New Democracy has deemed the investment of millions on firefighting aircraft “unprofitable,” so it continues to pay millions in renting. Kathimerini in Greek said the gov’t spends 30 million a year, and outstanding debts for 2007-2008 total another 30 million plus interest. In my Twitter feed, I linked to an article that I’ll also put here. Greece has burdensome bureaucracy, and prices higher than necessary for land/homes/utilities/food/etc., so I understand why people do it if they’re not rich or subsidized by parents/spouse/tax evasion. Plus, land grabbing is kind of a tradition, and people don’t see anything wrong with it. As I see it, no one has a right to complain if he/she broke the law, whether that be paying a bribe, building illegally or using connections to get out of something or get something done. While this is my first post to this site, it is not my first visit. I visit here frequently as it is the most informative site I have found on living in Greece. (A dream of mine that I hope will come true one day) My thoughts are with you, and I just hope that you stay safe. The news (of the fires) has been on the major networks here since Sunday. What has not made the news is the part where firefighters are being made to pay road tolls, Greece refusing the help of Russia and Austria, and not placing calls for assistance until Sunday morning. In one news article I read here, they did talk about pine cones. All I can say is how sorry I am. It is difficult to comprehend the number of fires that have been recorded just over the last 30 days!! Thank you very much Kat for keeping us informed over here. And thanks for this site. How nice, another person coming out of the shadows today. Hello! Thank you for your kind thoughts and compliments. It’s difficult to get a full picture of what’s happening, even when living here. There are details left out because of word count, deliberate omissions or inability to find/hear/verify the information. Hopefully you’ll find out for yourself one day when you’re here. Im not an expert on law or anything but shouldn’t the government change the law to declare forested areas banned from building regardless of whether there are trees alive or burnt! You said a mouthful. There are lots of laws, but they are both complex and contradictory, plus the justice system doesn’t work. That’s how people continue to get away with it. Oh, and apathy. I have the same feelings, although I’m Greek (and French) and live in France. I published on Monday a paper on the French news website Rue89 (Incendies en Grèce : des catastrophes pas très naturelles) which was mentionned by public radio only because I got the “clairevoyance” to mention that arsonists are not just poor guys in the bush but that interests are behind all these fires. Two years ago I had also published one article: was the fire of such a magnitude the result of Global Warming? Well… maybe, maybe not, was I saying then (La Grèce sous le choc d’incendies de forêts inédits | Rue89). Today I definitely think NOT! Too much evidence (of which the fantastic study which I would love to read complete of Skouras and Christodoulakis which I found on Kathimerini, thanks to ANemos) shows that Greece is simply being burned by Greeks who would love to become miraculously rich in one day. I think although less land was burned this year, things are worse. Not because of denial but because of lost hope. In the meantime, there has been the mobilisations in 2007, the elections of 2007 -let us NOT forget it- and the Dekemvriana! Just a bit too much to say that there is still hope. And yes, you are right : Why be afraid of Turkey? She can just sit there and wait for us to do the job of destroying the country by ourselves. Hi again Rigas, thank you for sharing your thoughts and articles today. With respect to climate change, it may not be the cause but it certainly isn’t helping. Even if people don’t believe in global warming, there’s no denying that temps are rising, winds are higher, there’s more desertification, lakes and rivers are drying up, rain isn’t as frequent (even India logs 26 percent less during monsoons) and the weather is much more unpredictable. 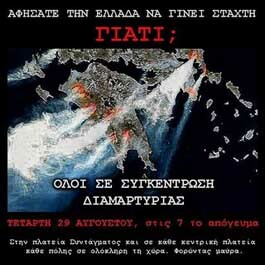 When I was here the first few years and my friends (all Greeks) told me about burning forests to grab land, I chalked it up to conspiracy and rumors that are admittedly rife in Greece. But as my fluency in Greek developed and my knowledge of Greek affairs deepened with research, reading Greek news (not English) and immersing myself in stats, it became clear. Just look at zoning maps, burned areas over the years, “development of cities/villages” shortly thereafter, and all the people who were silenced or fired when trying to blow the whistle. As you rightly point out, there is too much to say. It’s not as simple as developing policy and implementing laws; it’s part of culture, mentality, history… That’s a lot to overcome, and it won’t happen without commitment, action, and uncompromising righteousness. I don’t see it happening in this generation or the next, if ever. Your comment to my comment up there makes me think. Not this generation? The Neoellinas is in part incapable of taking political decisions that go beyond micropolitics. Then the generation that is now twenty? Do they just demonstrate, and then do as their mom and dad do, and shut up? You know… the house, the car, the things you buy, the TV, the telephones and things — if you look at a well-dressed, rather flashy, with the latest model telephone guy talking loud in the Metro in Paris, you can bet it’s a Greek. Among Mediterraneans we have somehow become super-consumers …. and the rest, to hell ! My country gets me angry. I just got back from 10 days in Greece. We attended a wedding not far south of the fire on the 23rd, and our friend had his grounds, but not his home, burned. I was struck by two things: first, the smell and the haze that makes ignoring the fire impossible, and second, the overall apathy of everyone about the situation. It is so sad to see that young people especially view this as something that cannot be cured, although I suspect that the evolution of the land registry will make this less profitable in the future. We were struck by the sky upon arrival – bright blue, with a smear of black and a cloud of orange. I will never forget the experience of attending a wedding reception with the spectacle of flames so clearly visible in the background and the smell of the fire in the air. It felt like we were dancing on someone’s grave. It is so tragic. And we say it again and again and again. And then we pray we won’t be in harms way for the next fire. The pictures of the loss of Alex house is a stark and very tragic fact (I’m so sorry. I hope help comes your way soon). These fires don’t just destroy the environment, they destroy people’s lives. In September of 2000 we moved to Corfu full time. The day we moved in, there was a fire out of control on the other side of the ridge; we live in a little valley. When the flames were in view, the moving men quickly finished unloading the truck and left everything in boxes on the terrace. Their truck was not insured for fire damage, so they left us. My husband unpacked the hoses, connected them and directed me to start “watering” . He got the shovels and grabbed a couple of extra old blankets, and while I watered the roof and the surroundings of the house, he quickly drove to the other side of the ridge to “help” with the fire. He came back an hour later shaking his head. He said large crowds gathered to watch and smoked cigarettes, throwing them into the fire on the edge when they were finished. No one knew how to dress — long pants, decent strong shoes — or deal with fires. He was told, politely enough, that it wasn’t HIS job to fight the fire, it was up to the airplanes. Everyone yelled for the planes to dump water and chemicals on the fire, and then ranted at them when they weren’t fast enough! It would seem that since this country is prone to fires, it would be logical that (like all Australians are taught to swim because they live near water) I think all Greeks should be taught basic fire skills, from childhood on!! There should be public service programs telling people what to do in case of fire and what NOT to do. Anyway, I wish there were more volunteer fire brigades and fewer guys standing around smoking!! ps/ the wind changed course that afternoon we moved in and by evening the fire had changed direction and been under control by the next morning. Sadly one of the pilots had flown into a smoke cloud and lost his bearings and crashed. Hi Kat, thanks so much for taking the time to visit my blog. It is a pleasure to discover yours and I look forward to exploring and visiting. Some things really do not change. Thanks very much for visiting our site which helped us discover yours as Ivy says above…it is great and very informative indeed. Don’t know if u r of Greek origin or not, but you come thru as a person who lives here and loves Greece and whose site is a great labour of love! We who live here see all the negative points but love it nonetheless…we just wish things could be different. Our site is intended for Greek-Somethings but it also encompasses Greece-Lovers! That is what being a Philhellene is all about.